Environmentally sustainable development is the high point of talk in almost all international fora these But a key policy question is the extent to which the existing tax and subsidy regimes encourage or sustainable use of the environment. The subsidies in 1991 for electricity and fossil fuels are estimated around US $106 billion worldwide, excluding the former Soviet republics. In the developing countries, for the rich is subsidised, further enhancing the inequity in income distribution, which under environmentally sustainable development. 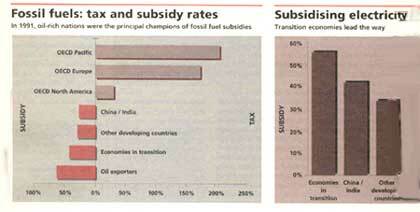 Subsidy rates for fossil fuels vary from 25 per cent to 60 per depending on the state of the economy. The correct level of energy taxation depends on the policy goals vary from country to country.